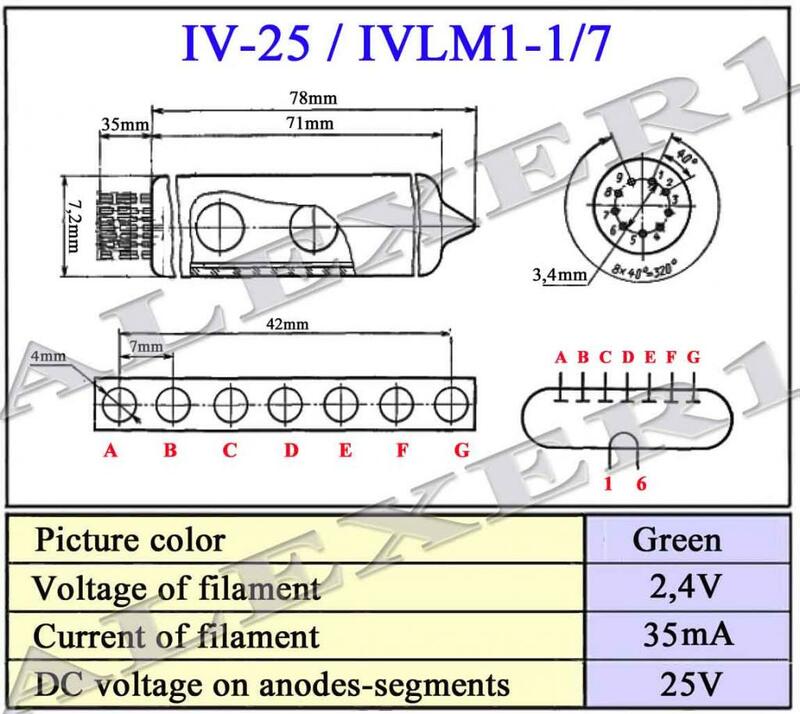 After considerable deliberation I ordered 20 IVLM1-1/7 nixie matrix tubes from Ukraine. 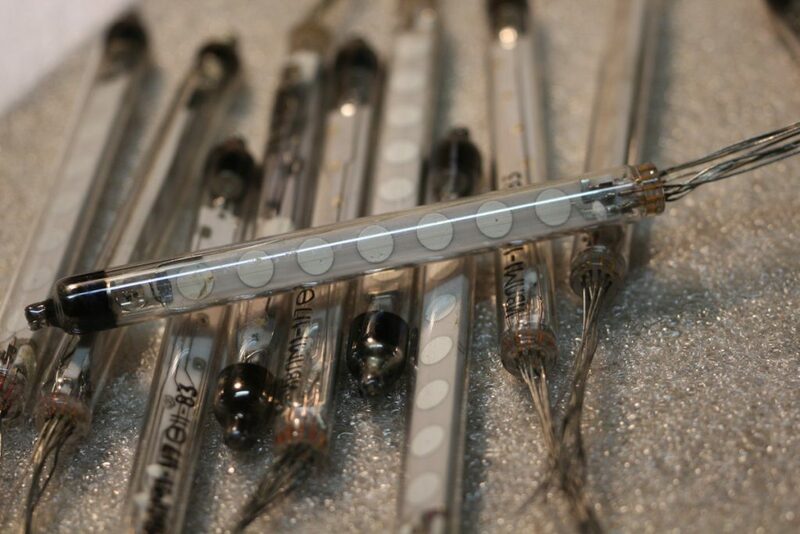 These are glass tubes with 7 phosphor spots, each spot independently illuminatable. I considered the numbered 0-9 neon nixie tubes but they require fairly high voltage (over 100V) and for a starter project 25V is just fine, thank you. 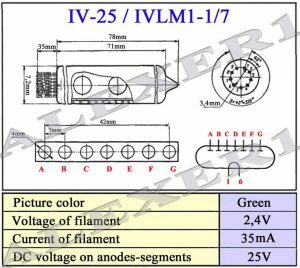 Research included joining the neonixie forum which advised me to mind that the almost identical IV26 have phosphors that are tied together to save pins on the chips in the Eletronika clock for which they were made. 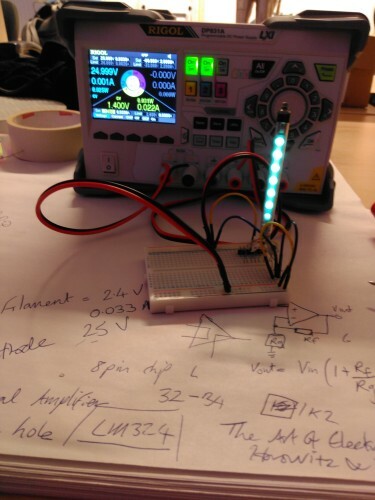 Successful test if the IVLM-1/7 with 25V and 1.4V filament voltage. Pin configuration on the IVLM-1/7 in this set-up. The second test was more successful – I set it up so it would be very difficult to put the wrong voltage across the filament wires. I found that varying the voltage between 6 and 26 volts varied the brightness. Also the spot on the phosphor changes shape with voltage which is sweet, and placing a magnet nearby creates extremely weird patterns – a bit like having your very own microscopic aurora borealis. 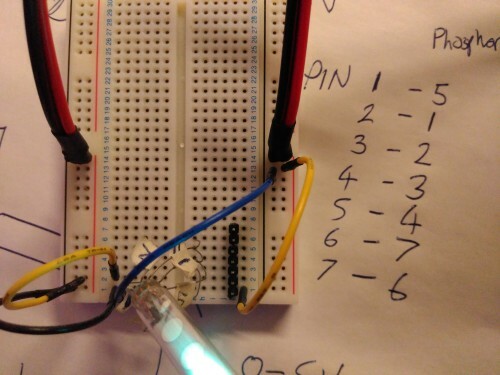 I’d like to create an array with variable brightness using operational amplifiers to control the brightness; I have already had some experience programming an arduino to animate a 6×6 pixel display. It’s not the simplest project and is definitely going to involve a lot of soldering!